I’m not a big fan of the Christmas baskets companies send each other, but I do like the especially good chocolate that comes in some of them. Today we are planning way ahead for some a business trip in April for AdTech San Francisco, so having this chocolate sitting on my desk caught my attention. There are plenty of good chocolate makers in the world, and Ghiradelli is one of them. You can argue which you like best, but I’m a fan of Ghiradelli. Really, how can you go wrong with chocolate and caramel together? I had a great time with the kids while sledding. I love to get out and play with them, but half the fun for me (of course) is to capture video and stills of them having fun. I try to make sure and balance out “my” fun though and make sure I actually participate in the activity with them as well! I don’t want them to grow up thinking that dad is just that guy that is always behind the camera! 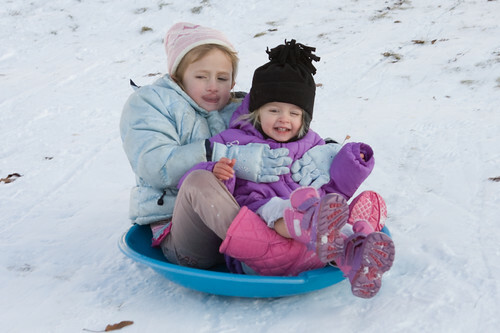 This was the first time sledding for the youngest. You think she enjoyed it? Yesterday we took the kids out for some sledding in the snow at a new spot. It ended up being a great one. I was primarily taking video and some still shots of the kids sledding, but I snapped this one of my wife carrying our youngest back up the hill. I find snow scenes particularly difficult to capture with the bright reflectiveness of the snow throwing of the exposure and white balance. I have yet to purchase a good polarizing filter that would help in these situations, so I do my best to meter the people in the shot and hope for the best. Often photo opportunities come up very spur of the moment, so I always try to be ready with my “go bag” of my favorite and most versatile camera equipment. I think in the coming weeks I will post a photo and description of what I have and how I carry it. This model was doing a commercial for ClearPlay and I was asked to take a some still photos for use on their web site. The lighting was all set up for their video work, which produced some nice, even lighting; but what I have found is that video lighting is often darker than what I prefer for still photos. I increased my ISO a little and dropped the shutter speed down (since this was an adult that knew how to hold still versus little kids) and things turned out well. I was always impressed by this Pee Wee team with their intensity and effort, but I was impressed even more how they pulled together for the second and third string players. I enjoyed this scene how the players on their own jumped in to help their injured teammate. From a photo perspective, this particular shot reminds me that it is not always the action during the play that can make a great photo. By keeping your eyes open and looking for photo opportunities between plays you can often pick up some great scenes. In particular I often like to look for player interactions, expressions and also the fans for shots that can be fun to capture. I love photos where the expressions or at least eyes captured on an individual tell a story. The intensity in this shot is a lot of what makes it one of my favorites. This particular player was one of those quiet, hard working team members that really made the season special. He played almost every position and worked hard at whatever the coaches assigned him to. It’s pictures like this that make lugging around the big, heavy gear worth it. I love capturing memories that can be shared with others and hopefully treasured for years to come. Update: This photo has just been selected by Kodak for their Kodak Picture of the Day on February 3, 2008 (Superbowl Sunday). Always a fun selection to get! This star receiver could catch practically anything. As long as it was within reach he would catch it. As shown in this photo, even if it wasn’t within reach, he put out the maximum effort. I was particularly pleased with the performance of my recently upgraded to Canon 40D on this shot. The 6.5 frames/second gave me the opportunity to capture this frame and those just before and after for a very fun sequence. I have learned when photographing sports action that must learn to anticipate action, frame your shot and take a burst of frames beginning ahead of the ideal shot. If you wait until the moment you want to capture develops, you are more likely to hit the shutter just after the ideal moment has already passed. You can always discard the unnecessary frames later and save the “keeper” in the end. I had a lot of fun this year with my son playing pee wee football for the first time. He has had a lot of difficulties this year, and football was the highlight of each day for him. The coaches were outstanding, which is really the key to having a great experience at this age. This coaches son was one of the hardest working of the bunch, giving his all to every play. I had the video camera at most games, but at this particular game I handed video duties to another parent and brought along the still camera. Over the next few days I am going to post some of the best images of that day. On the photo walk in Salt Lake City I discussed yesterday, I took a few moments to capture shots of the floating lights found in the pond outside of the Temple Square. I always take a special interest in these because it was a previous neighbor of mine that invented them. I think they make a fun addition to the ambiance and the decorations chosen to adorn these special area. No matter how much you know, or think you know, about photography, there are always others out there that can astound you. I have been entirely self-taught in my hobby/craft along the way, experimenting and correcting as I learn new things. I enjoy the challenge, and periodically I feel like I can capture something special. This is what I love about digital photography, anyone can do what I do if they are willing to put some time and effort into it. With some additional learning in mind, last night I joined a group of photographers in Salt Lake City for a “photo walk.” This is nothing more than an excuse for people with a similar hobby to get together and have some fun trying to capture some great photos. With the weather and not knowing people all that well, I do wish I had spent a bit more time getting to know some of the individuals that were there, but I am sure that will happen over time. What has struck me the next day is the quality of images being shared online from this group. I thought I ended up with a few shots I was pretty happy with, but when I look at what some others produced I have seen already I realize how much I can really learn from these people. Everything from composition to the post production they have done to enhance their images. I am truly impressed and hope I can contribute as much as I hope to obtain. You can see a few of my other images from this day at my new flickr account or the complete set over at gogetphotos.com.